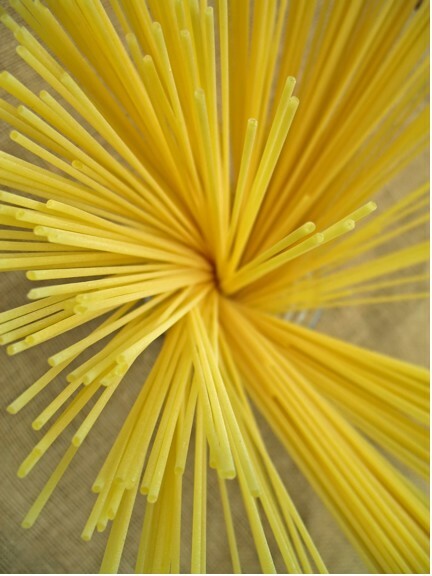 Despite my fondness for things noodly, I can’t enjoy pasta very often: Carbs settle on my hips, and my mood suffers if I eat too much of the stuff. This is frustrating, because pasta is not only inexpensive and easy to prepare, but its “portionability” is perfect for folks like me who are cooking for one. So I was limiting my Zoba (a noodle bar) visits to about once a week, when I read about something extraordinary. Something amazing. Noodles with no (or very few) carbs and no (or very few) calories. 1. Significant appetite reduction. I am not kidding. These noodles are not only filling, but they really help to stave off hunger pangs. 2. Yes, I have lost weight since I added the noodles to my diet. I am NOT claiming that my experience is typical, but after adding one 7 oz bag of noodles to my daily menu for a week, I dropped 4 lbs. 3. I feel that my blood sugar is more stable, even if/when I eat sugar and/or simple carbs. The traditional shirataki noodle, made only of glucomannan flour, are gelatinous, slightly elastic, with a distinctive texture. I have found them most suited to asian sauces and dishes. They don’t have much of a flavor, but generally take on the flavor of whatever sauce or food they are tossed with. The part-tofu shirataki noodles, on the other hand, have much more of a traditional pasta-like texture, and I have prepared them with both Asian and Italian sauces, but I really prefer them with Italian (i.e. tomato) sauce. Their texture is firm, but decidedly softer than the original shirataki. 1. Put the noodles in a strainer or colander, and drain. 2. Run cold water over the noodles for several minutes until the “fishy” smell vanishes. Shake off as much water as possible. 3. Place the noodles in several layers of paper towels and squeeze gently so as to remove water without breaking the noodles..
4. (Optional, but wise, step.) Bring a pan (nonstick is best) to medium heat on the stove, and add the noodles. Heat and toss for about a minute until any remaining water evaporates. 5. The noodles are now ready to use. 1. Don’t freeze them. Doing so will affect the texture. 2. Don’t overcook them. Add them as the last step to a hot dish or soup, and only heat enough to warm through. 3. Don’t microwave them. Again, this will affect the texture. A Google search will reveal many recipes for the noodles, though I find that working with them is a matter of common sense. For example: Place part-tofu noodles in a shallow baking dish, top with spicy tomato/meat sauce, and cover with mozzarella cheese. Bake the dish at 400º in a toaster oven, and the result is a freshly baked pasta dish with a fraction of “regular” pasta’s calories and carbohydrates. A little while ago I learned that the average entree at a Chinese restaurant is over 1,000 calories. Even worse, the white rice served with Chinese food can add as much as 300 calories to the dish! Yikes! The trick here is to enjoy your Chinese carry-out (i.e. take-away) without doing serious damage to your calorie count. Portion out the entree (say maybe a third) onto a bed of shirataki noodles. At this point you have a substantial, filling meal for under 400 calories, plus food left over to share or for the next day. Pretty neat, eh? In the United States, Whole Foods Markets carry the part-tofu shirataki in their refrigerated section: It is usually kept near the tofu. Asian grocery stores also carry them in their refrigerated section (you may have to hunt for them, and they are sometimes called “Yam Noodles”). In addition, a number of online retailers sell them as well. If this blog post has inspired you to try shriataki noodles, please let me know. I’d love to hear about your experiences with them! I just eat a plate of these yummy noodles. I’m Stuffed. I read about them on the web and heard that Publix carried them so I went out to buy them. I was not sure when i first opened the pack but I read that once you rinsed them they did not smell. I also read that they were better fried so I stir fried them. the first time i made them i was not sure but i had bought two packs and the second time i got better at making them. The longer i fry them the better they taste. It is hard to burn these noodles. I add garlic, olive oil, Parmesan cheese. or Chicken flavored soup base, garlic salt, frozen pearl onions, red & green pepper sliced. Yum. I am eating a low carb diet and these are satisfying and filling. Thanks for the feedback, you are right they may be difficult to find but the stores that do keep them are always expanding. I like your light suggestion with the garlic, olive oil and parmesan. I wonder have you ever baked the garlic before adding it to the meal, as this changes the texture and subtle flavour the garlic is somewhat sweeter. Again I really enjoy responding to our readers and look forward to many more replies. thanks for taking the time to comment on this article, next time I am in the windy-city I will be sure to drop by and give them a try. Cool to know! My dad just brought this up and your article is very informative, thanks!